Superfoods are "nutritionally dense" foods, that have extra health benefits which come from "antioxidants" and "phytochemicals". If a food is nutritionally dense it means that the food has high concentrations of essential vitamins and dietary minerals that we know are required by human beings. That includes all the vitamins we know so well, such as vitamins A, B, C, D, E, K, and also essential minerals such as Calcium, Iron, Potassium, Magnesium, Zinc and others. But these are found in many different foods already. In fact, all foods we eat every day (even junk food!) contains at least some vitamins and minerals. 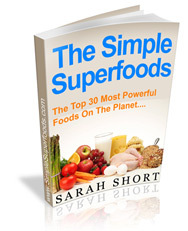 What's so special about super foods? The main difference is that super foods have an unusually high amount of nutrients for their size, when looked at alongside normal foods. As an example, the humble cucumber is mostly 90% or thereabouts water, so to benefit from any decent levels of nutrients from a cucumber you'd have to eat a whole one. Or two! Superfoods are so powerful that even as much as a handfull can give you a decent sized portion of nutrients, sometimes providing your entire recommended daily allowance (or more) for individual vitamins or minerals all in one go. Now that's super! Very few foods show such high levels of nutrients in such small quantities, and that's why they are so exciting. Let's start with antioxidants. These are natural chemicals which stop oxidation inside the body. Oxidation is basically damage caused to cells when they react with oxygen. It is this damage which is linked to many unpleasant conditions including premature ageing, degenerative diseases and some cancers. Antioxidants soak up or stop the oxygen from damaging cells and in theory reduce the risk of illness. An everyday antioxidant you are probably aware of is vitamin C (otherwise known as ascorbic acid). Phytochemicals are naturally occurring compounds found in plants and animals, which are not yet recognised as being an essential vitamin or dietary mineral. "Essential" vitamins and minerals are known to be required by our bodies for us to survive, but we're only just starting to really see the real potential health benefits of these ingredients. Much of the suggested power of superfoods (such as anti-cancer, anti-heart disease, anti-ageing and so on) is down to the different phytochemicals found inside them. So, not only do superfoods contain high levels of essential vitamins and minerals, they also contain high levels of phytochemicals and antioxidants making them even more powerful! ...as human beings, we need vitamins and minerals to survive. If we don't get enough of these nutrients, our bodies stop working so well. Now we're discovering amazing new nutrients which can help to boost our health and prevent disease. Super foods combine essential and non-essential nutrients and taste good too, even more reason to start including them as part of a healthy diet.